You can’t address oral hygiene holistically and effectively without considering the effect of diet. The foods and drinks we consume have a direct and powerful impact on our wellness, including the health of our teeth and gums. Some of the things we put in our bodies – processed and sugar-laden foods and sodas, for example – are destructive forces which make the fight against tooth decay and gum disease that much harder. Conversely, there are plenty of healthy, natural products which not only do no harm, but actually play an active and productive role in improving our oral health and overall wellness. Green tea is one such product. For centuries, people in China, Japan, and India have used green tea for its many health benefits and healing properties. Modern research has only confirmed the positive health effects of green tea. In fact, recent studies have found that green tea can have a preventative and therapeutic effect on a wide range of health problems, including heart disease, cancer, high cholesterol, stroke, type 2 diabetes, skin disorders, memory loss, Alzheimer’s, dementia and liver disorders. The same qualities of green tea that reduce our vulnerability to these conditions also play a similar role in promoting oral health. Green tea is flush with antioxidants, including the antioxidant catechin, which play a crucial role in minimizing inflammation throughout our bodies. These anti-inflammatory properties can be an effective tool in reducing periodontal disease, which generally results from bacterial infection from the buildup of plaque on our teeth. By minimizing the body’s natural inflammatory response to these bacteria, antioxidants can reduce symptoms such as swollen or bleeding gums, the recession of gum tissue, and bone loss. A recent Japanese study of 940 subjects published in the Journal of Periodontology found that for each cup of green tea consumed each day, there was a corresponding reduction in all three indicators of periodontal disease, pointing to a lower incidence of gum disease in those participants who drank green tea regularly. Additionally, other studies have shown that antioxidants may reduce the likelihood of developing oral cancer by fighting and slowing the growth of precancerous cells. Not only can green tea reduce the effects of bacterial infections through its anti-inflammatory qualities, it can also reduce the amount of bacteria itself. 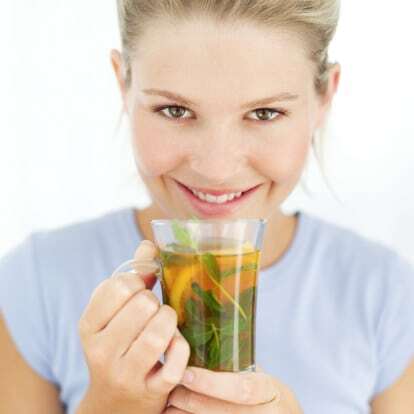 Green tea possesses powerful astringent properties that can neutralize the bacteria which causes gum disease, bad breath, tooth decay, and other problems. These same properties can also reduce acid levels in the mouth; high levels of acidity lead to the loss of tooth enamel and speed tooth decay. Stronger teeth, healthier gums, fresher breath, lower cancer risk – all found in a beverage that can be a tasty and relaxing part of your day. Next time you’re thinking of having a cup of coffee, consider green tea as an alternative. Your mouth and your body will thank you.